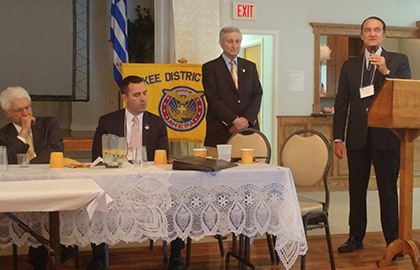 AHEPA Yankee District #7 held its annual Convention at St. George Greek Orthodox Church Social Hall in New Briatin, Connecticut this past May. 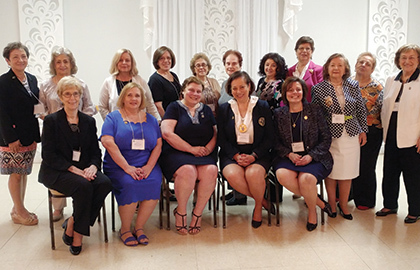 In addition to the usual business of planning initiatives for the new year and electing new Chapter Officers, the feature of the Convention was a transcendent Panel Discussion, entitled “A Century of Achievement”; Where will AHEPA be in 2022: AHEPA at the Crossroads”, an examination on the current state and future relevancy of AHEPA as it approaches its 100th anniversary. The theme of the symposium was the challenge faced by the organizations, adapting to changing demographics, such as the predominance of mixed marriages, and changing priorities amongst families in the modern technological age. The long-planned discussion centered on how AHEPA needed to reimagine itself and adjust to societal changes, be it the independence given to local Chapters to make an impact in their local community combined with an appropriate sense of direction from National leadership. The transparent, provocative and constructively critical discussion was organized by Attorney Gregory Stamos, Past Supreme Counselor of AHEPA, was moderated by Jim Zafiros, former Senior Vice-President at NBC New from New Rochelle, New York and the presenters were Jimmy Kokenos, of Brooklyn, AHEPA Supreme Secretary, Anna Hellene-Grossomanides, former Grand President of the Daughters of Penelope and Dr. Evangelos Hadjimichael, former Dean of the Fairfield School of Engineering and AHEPA New Haven Chapter #98 President. Kokenos spoke about the flexibility that each Chapter has in addressing local needs and responding to initiatives that resonate within its membership; Grossomanides and Stamos stressed the need for collaboration with other Hellenic organizations in this era of membership challenges, and Hadjimichael presented a video on the necessity to develop foundational strength through connectivity with local Chapter members at the local Chapter level. 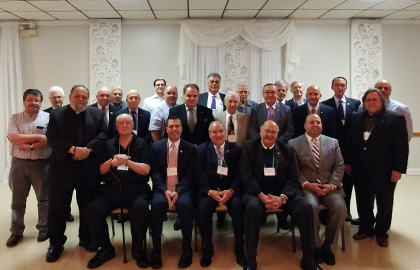 This ground-breaking session illuminated not only the successes of AHEPA through its nearly a Century of achievement, but also highlighted the challenges of adapting to changing demographics and initiative amongst the Hellenic community.